2012: That seems to be magic number these days. A chorus of voices, left, right and center proclaiming this date to be either the end of the world or the start of “something wonderful” (echoing the ghost of astronaut Dave Bowman in “2010” – two years short of target). Whether people will gather on hillsides, dressed in white linen, waiting for The End, remains to be seen. Forecasting the end of the world is another of those games that anyone can join, a freewheeling speculative poker game of sorts. A date is proclaimed, anticipation builds, and when the eschatologists are proven wrong, citizens quietly return to their pre-apocalyptic lives. One book in particular influenced many lives – Rodolfo Benavides’s The Dramatic Prophecies of the Great Pyramid (Dramáticas profecías de la Gran Pirámide) – to the extent that many readers refused to raise families out of a fear for the hideous future in store. By the year 2005, said the book, humanity would be reduced to “short-lived radioactive mutants” after a series of nuclear wars, the birth of a new moon ripped out from the Pacific Ocean, and the approach of the rogue planet Hercolubus, whose presence in UFO/contactee/paranormal circles could fill several books. Luckily for us, eschatological interpretations of the Great Pyramid’s “prophecies” have an abysmal batting record. But after three major earthquakes brought devastation to Sumatra and Samoa in late September-early October 2009, the possibility that our world could meet a cataclysmic end was in the air once again. Could seismic activity in this part of the world herald the detonation of the Yellowstone Supercaldera, the collapse of Cumbre Vieja on the Canarian island of La Palma into the ocean, or unleash devastating forces in the Puerto Rico trench? Apparently no prophet has stepped forth to set an exact date. 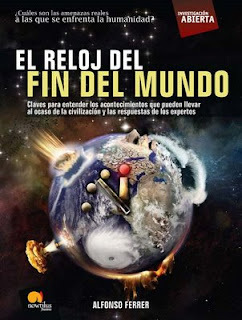 Alfonso Ferrer’s excellent El Reloj del Fin del Mundo (The Doomsday Clock) (Madrid: Ed. Nowtilus, Serie Investigacion Abierta, 2008) approaches the possibility that contemporary events and very plausible could lead up to an “end of the world” every bit as spectacular as what is contained in prophecy. Wars, catastrophes, climate change and pandemics can have as shattering an effect as any Wagnerian apocalypse. Ferrer also examines other possibilities, such as “the creation of a micro black hole” through misguided scientific experimentation as a way to clean our clocks. Ferrer’s end of the world scenario, while not tied to a given year (although he does mentioned a possible asteroid impact in 2036), is inexorable. The year 2012 and Mayan long count aside, we are shuffling toward our own disappearance unless a major breakthrough takes place that allows us to continue our breakneck expansion. The only problem with El Reloj del Fin del Mundo is that it remains untranslated, but with the thirst for information on possible outcomes for our species, it is an oversight that a publisher will surely correct. Inexplicata gives El Reloj del Fin del Mundo five (*****) stars. Contact Information: Editorial Nowtilus, Dona Juana I de Castilla 44, 3C, 28027, Madrid – Spain.